Bev's Country Cottage Blog: MITTEN-ALONG- Last part!!! Here you go! The final thing you can do for those mittens, IF you want to. Works well so little ones don't keep losing their mittens! Join yarn to one cuff at seam stitches and then sc around entire cuff. * make a ch about 2-2 1/2 feet long and join with sl st to other mitten at seam. * Sc around that mitten too, and you now have a string to thread mittens through coat. Cut a 4" tail, thread onto a needles and weave tail through the inside of the mitten. For extra warmth, use double yarn and brush the inside of the mitten with a hair brush to make it 'fuzzy' and soft. HUG THE ONES YOU LOVE!! Just stumbled across your mitten-along - whee! I may make a few pairs of these! This is just what I've been looking for. So much yarn left and what to do? 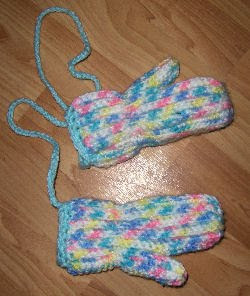 Now I have mittens to go with the hats I make for the people who need them the most. Thank You and GOD'S blessings always. What a wonder you are to so many. I love the mittens and will be able to use up all my extra yarn. Now I can have mittens to go with the hats I make for people who really need them so. GOD Blessings on you and Thank You for all you do in this world.